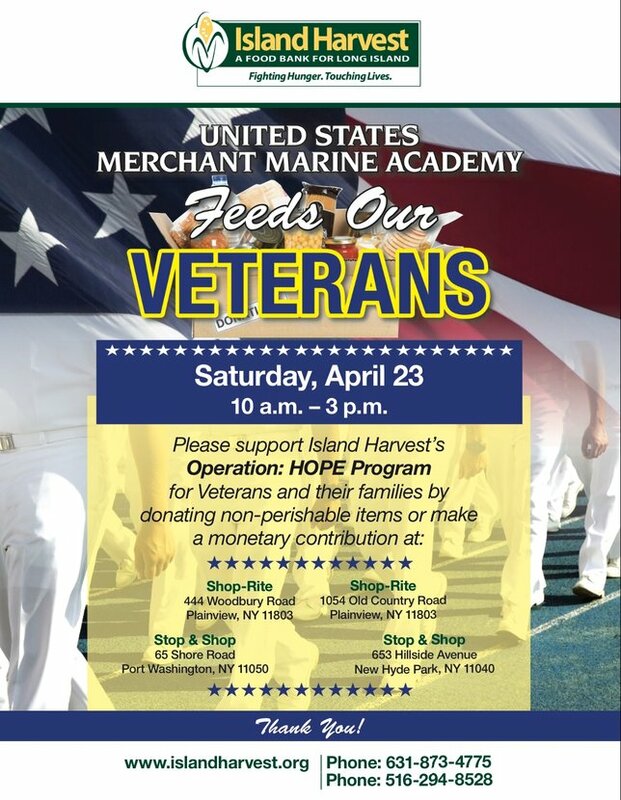 Food drives will be held on Saturday, April 23rd from 10 a.m. to 3 p.m.
Hauppauge, NY - April 21, 2016 - The United States Merchant Marine Academy based in Kings Point will host a series of food collections at four sites in Nassau County on Saturday, April 23, 2016, from 10 a.m. to 3 p.m. to benefit Island Harvest Food Bank’s Operation: HOPE mobile food pantry. Operation: HOPE provides food and other assistance to veterans and families of active duty military personnel in need. Donations of nonperishable food items, personal care products or monetary funds are appreciated. Launched in 2011, Operation: HOPE mobile food pantry is a specially-designed refrigerated van that serves veterans and military families in Nassau and Suffolk counties. It is staffed by volunteers, themselves veterans, and provides much-needed food, household supplies, and personal care products directly to Long Island veterans and military families. Operation: HOPE program also provides vital information and referrals to link veterans and military families with benefits and services that can help them. For more information visit islandharvest.org or call 631-873-4775. Island Harvest Food Bank is a leading hunger-relief organization that provides food and other resources to people in need. Always treating those it helps with dignity and respect, its goal is to end hunger and reduce food waste on Long Island through efficient food collection and distribution; enhanced hunger-awareness and nutrition-education programs; job training; and direct services targeted at children, senior citizens, veterans and others at risk. Approximately 94 cents of every dollar donated to Island Harvest goes to programs that support more than 316,000 Long Islanders. Island Harvest is a lead agency in the region’s emergency-response preparedness for food and product distribution, and is a member of Feeding America, the nation’s leading domestic hunger-relief organization. More information can be found at www.islandharvest.org. Subject: LongIsland.com - Your Name sent you Article details of "U.S. Merchant Marine Academy to Host Food Drives on Saturday, April 23"